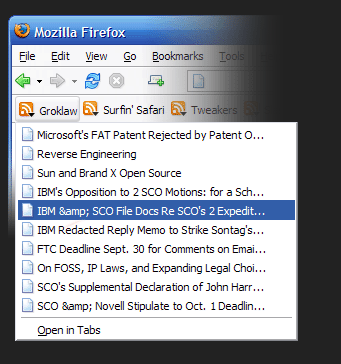 As you can see in the screenshot above, the title of the story called ‘IBM & SCO File Docs Re SCO’s 2 Expidit…’ is mangled. The & is turned into &amp;. The cause of this problem is actually pretty simple. In valid HTML code, &’s must be written as &amp;. Usually the function htmlentities() or function htmlspecialchars() is used for this purpose. Now, when you run that function twice of the same string you’ll get something like this: &amp;amp; which is displayed as &amp;. Another unrelated bug is that the RSS feed of the Groklaw website isn’t automatically detected by FireFox’s live bookmarks feature. The solution to this is also pretty simple. It requires just the addition of a single line inside the HTML template. That single line triggers the live bookmarks feature. Next: Yay, I got an gmail account!